This was an Elderhostel sponsored event. At the suggestion of Homer Eaton (Thanks Homer!) 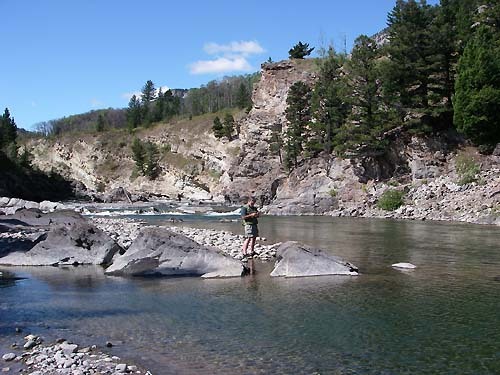 club members Bob Schwehr and JohnFiles signed up for this trip to fish the “Old Man”, Crowsnest, Carbondale, and Livingston rivers. Along the way we passed through Glacier park and saw Grizzly Bears, Big Horn Sheep, and got within six feet of some mountain Goats during a day hike off the “Going to the Sun” road in glacier. 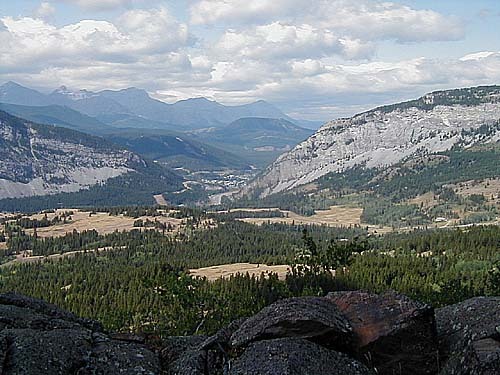 As we climbed toward the Crowsnest pass, we saw plenty of Pronghorn Antelope. The weather and scenery were great. We had a large group of 39 people, and six guides. We stayed in simple dormitory rooms. They did the cooking, we fished and socialized. 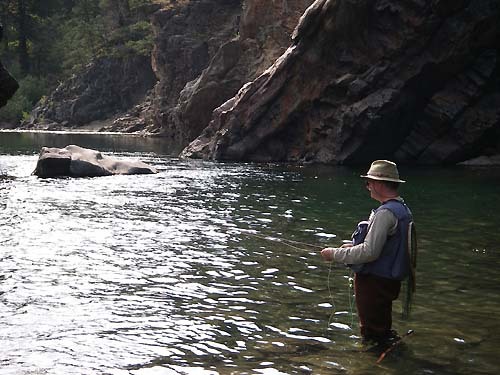 There were casting and fishing classes for the people new to the sport, and lots ofon-stream advice from the friendly guides who strolled along socializing and reminding us of their “favorite” fishing holes. The days were spend fishing the various rivers in small groups, and the evenings involved tours of the town and coal mines, or fishing the “evening hatch”. As it turns out the peak time for fishing there is reportedly July 15- Aug 15, so we missed it by a bit due to family obligations (my daughter’s wedding), and went on the later trip. Monday we fished the Carbondale river. We drove out through the aspens, and high mountain passes, past signs of an old forest fire, and parked by a corral for loading steers into trucks. While we were off fishing some legitimate cowboys brought in steers and loaded them up for market. We heard the noise and saw the dust off in the distance. The river was maybe 40 feet across and a bit low, a freestone stream, in the woods, with granite rocks. 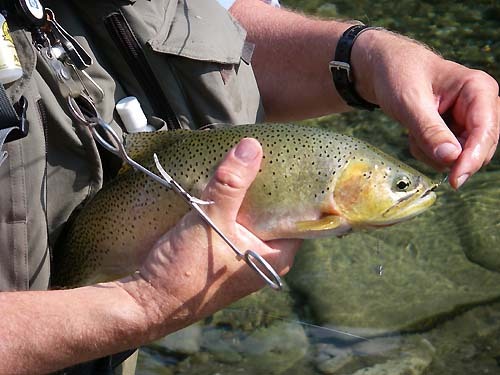 Most people seemed to catch 4-6 cutthroats in around 5 hours. Bob had 10 fish on with terrestrial dries, and did not land a one! John had the first fish, and big fish,honors, using his cone-head leach patterns. The guides said the river was about 4 feet lower than it was in late June. Monday evening we fished a section of the Crowsnest, a pretty little river, that was sort of a combo of freestone and spring creek. There were more rainbows in it. There were sure rises, and some people caught a few fish. The next couple of days we fished on the Old Man River, that reminds me a bit of a smaller version of the McCloud in California. We walked in across fields of grain, Aspens, and Pine. This is a gorgeous river, with pools, canyons, slots, clifts. Did I mention we caught cutthroats from 14-20 inches? Check out the pictures. Bob unhooks the nice Cuttthroat on the upper Oldman in a slot canyon. 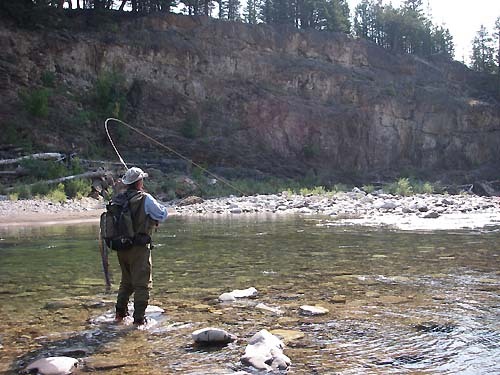 The next days we fished other sections of the Old Man on an active, private ranch. One our guides (Gary) is on the town council, and got us access. 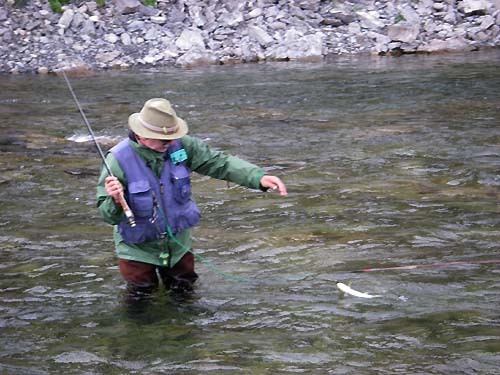 Bob caught several 18 inch cutthroats in the slots, and pools along with smaller fish in the faster water. John did as well. In this location we parked 100 feet from the river. Bob spent several hours here to catch 2 nice fish… Old Man at the Ranch. And it paid off…. There were a half dozen holes in 100 yards. 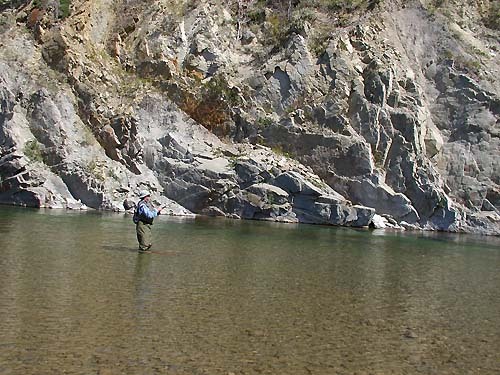 Other groups fished the Livingston and lower section of the Old Man River with similar results. Experienced fishers were catching 6-10 fish a day. Everyone caught fish. John enjoyed the fast water on the Old Man River. In the following evenings we got a walking tour of the town, hearing first hand how the miners lived, played, and walked to work. The ore veins run up at a 30-40 degree angle. The miners would climb into the rooms with ropes and shovel the ore down to the waiting ore cars. They would swing from room to room by rope. One of the guides (Dave) had worked on a crew that was salvaging mining equipment, and his father and grandfather had worked in the mines. They were finishing up a miner’s museum, and gave us a narrated tour. A Pretty section of the Old Man River … This is off the hwy going north to Calgary. If you want some great country, with friendly people and guides, and pretty good fishing ( we were told it was great fishing Aug 1), we recommend this group. You can go on line at elderhostel.com to find it. You can also contact the guides directly, and go any time without the group. Gary Taje: Loves to nymph fish, and is a weath of information on the area. lots of hidden places to fish in the area. 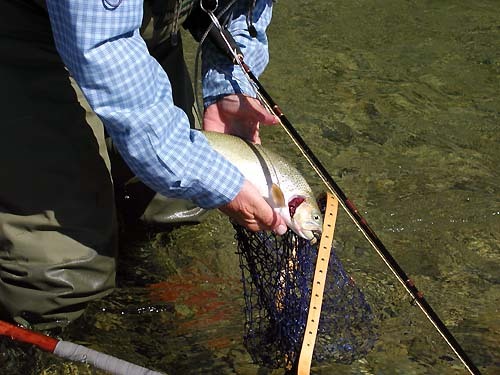 easy going, and loves to dry fly fish with a 3 wt. rod. They also lead adventure and mountain biking trips.